William “Bill” Mead is quite a clever chap. He has actually discovered how to bottle lightning! 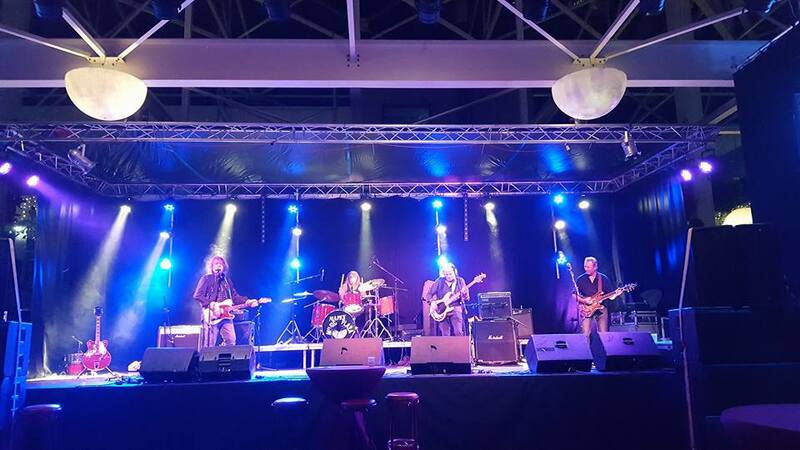 Ask anyone who has seen and heard Bill’s high energy rock and blues band The Sharpeez – on a stage in a pub, club or festival across Europe and the UK during the band’s lengthy musical career, and they will confirm this feat. Incendiary performances and the ability to connect with an audience of any size and age, to create a guaranteed electric atmosphere and lasting memories, sets this outfit apart from their peers on the blues and rock circuit. The individual musicians in the line-up have fabulous playing pedigrees, but as a unit, they have chemistry you could cut with a blunt knife! Bill and the chaps can pen a decent song too, and transfer that on-stage power and energy to record, as evidenced on their cracking new album, “Wild One”, due for release in Spring 2018. Their fifth album – named after the classic Marlon Brando movie. Recorded in France, where they teamed up with acclaimed recording engineer Paul Madden, who has worked with a myriad of stars including The White Stripes, Jack Bruce, Robin Trower, The Stranglers and many others. The material, the performances and the production all have equal importance across the new record, and Bill’s innate storytelling skills on the songwriting side of things, are most definitely to the fore. There’s groove galore, there is ample feel, they get down and dirty with some sizzling slide guitar licks and they rock out when required. There really is “something for everyone” on the new release, and the same can be said when you catch these cool cats live. A smile on the faces of the guys and gals who walk away from a Sharpeez gig at the end of the night – whether that is in Europe, the UK or further afield – is regular currency and reward. The Sharpeez, formed from the ashes of popular 1970s London and Kent band Rebel, became hot favourites alongside Dr Feelgood and The Stranglers in all the major London pub rock venues of the time., such as The Hope and Anchor and The Marquee. In 1984, they decided to take a hiatus, which became almost a 20-year period. The band returned in 2003, with Baz Payne on bass, Spencer Blackledge on drums and Bill Mead playing the guitar and lead vocals. Today’s core line-up is Bill Mead on lead guitar and lead vocals, Loz Netto on guitar and vocals, David Tettmar on drums and Michael Steed on bass. There’s also a “first call” A-Team who step in to augment the core line-up, or when any of the main guys are indisposed; including star drummer Brendan O’Neill, who played with Rory Gallagher and Nine Below Zero. The Sharpeez have won widespread critical acclaim with their albums, especially 2011’s “Open For Surgery” and their last studio release, “Mississippi Thrill”. Bill Mead has a long history of writing and recording music. He released his first single “Rocka Shocka” with Rebel in the 1970s. He was signed by Fischer Z Management, and he wrote and recorded the album, “Strangers in New York” for Red Admiral Records. “Mississippi Thrill” dropped in 2014. Tracks from this acclaimed album made the Top 10 of the prestigious IBBA chart (Independent Blues Broadcasters Association) “most played” chart. Loz Netto is an internationally respected musician, composer, songwriter, vocalist, guitarist, producer and recording engineer. A former member of the hit band Sniff ‘n’ The Tears. He began his professional career in the 1970’s and at 17, was hired to play the guitar on tour for Drifters legend, Ben ‘E’ King. He then joined the cult soul/funk band Moon as guitarist and songwriter, and in 1976 signed to CBS records, recording two albums with the band, while touring the U.K and Europe. Loz became a founder member of Sniff ‘n’ The Tears and by 1978 the band had a worldwide award-winning hit record with “Drivers Seat”, from their acclaimed album “Fickle Heart”. Loz recorded two albums with the band and toured the world, including a three-month tour of the USA, playing huge football stadiums. He appeared on Top of The Pops, The Old Grey Whistle Test and other major TV shows in Europe and the US. In 1982, Loz launched a solo career signing to Polygram Records and recorded his debut solo album at George Martin’s Air Studios. His first single “Fade Away”, appeared in the U.S top 40 for six weeks. The single went Top Ten in Holland and charted in most European countries. He recorded two albums for Polygram. He was then signed to Atlantic Records by label founder Ahmet Ertegun, and his album for the label received critical acclaim, and various songs were used in U.S films and T.V shows. He has toured with Tasmin Archer and Paul Young among many others. His songs have been covered by Chaka Khan, Joe Walsh, Rick James, Kenny Loggins and others and been used on many TV and movie soundtracks. Bassist Michael Steed has a solid CV too. He played with The Marmalade, The Rubettes and spent 18 years with hit pop band Love Affair. He has also been a sought-after bass player for theatre bands, in hit shows such as The Rocky Horror Show and The Blues Brothers. Drummer David Tettmar played in the acclaimed Rosco Levee Band. There is palpable chemistry with these four remarkably versatile and vastly experienced individual musicians – but as a unit under The Sharpeez banner, they are a formidable force.